A Bundle that gives you four great products for a full year of history and geography studies with recommended literature and a variety of activities, all in one discounted package! The Story of the World Vol. 3: Early Modern Times, Activity Book. This paperback book is complete with coloring pages, review questions, map activities, projects, recipes, games, literature suggestions, and lists of additional resources. The Story of the world Vol. 3: Early Modern Times, Student Pages. We made an extra copy of all of the consumable pages from the Activity Book, so you don’t have to! This set comes as a shrink-wrapped, 3-hole-punched, loose-leaf packet ready for your student’s binder. You are free to make as many additional copies as you need for your household’s use. The Story of the world Vol. 3: Early Modern Times, Test Book & Answer Key. This paperback test booklet is only recommended for use with an upper elementary school student or any middle school student. It has multiple-choice, true-or-false, and short answer questions to help your older students review and retain key information. 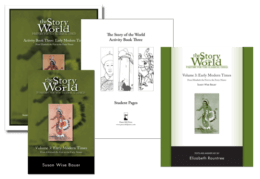 Tests for The Story of the World Volume 3. Consumable sheets from the Activity Book for The Story of the World, Vol. 3 If you have purchased this physical copy of the Student Pages between April 2010 and August 20, 2010, you may have an incorrect version of Student Page 23, Chapter 8 Map. Please download the Corrected Student Page 23 (Chapter 8 Map). Use this alongside the Story of the World text to flesh out the stories and history that your children are learning. Reading lists, activities, map exercises, and coloring pages give a more complete picture of life in early modern times. 410 pages. If you have purchased a physical copy of the Activity Book between April 2010 and August 20, 2010, you may have an incorrect version of Student Page 23, Chapter 8 Map. Please download the Corrected Student Page 23 (Chapter 8 Map) at http://bit.ly/1r97Ocq. Learn about the explorers, settlers, and native people all around the world in this brilliant narrative history for elementary-level readers. 419 pages. Can I upgrade the combo with a hardback instead of a soft cover? Unfortunately not. It’s a fixed package. does the curriculum cover American history as much as world history? It’s a world history curriculum, but there’s quite a bit of American history in it…more American history gets covered here than any other country. The following American history topics appear: the Jamestown colony, the early French explorers, Henry Hudson’s explorations, the Pilgrims, Plymouth Colony, the Dutch colony of New Amsterdam (later New York), the founding of Pennsylvania, tobacco plantations, slavery, struggles between France and England for control of the New World (including the French & Indian War)…the dissatisfaction of the colonists with British rule, the lead-up to Revolution, the Revolutionary War, the Constitutional Convention and the Constitution, the first president, early factories, the Louisiana Purchase (plus Lewis & Clark’s expedition), the Indian resistance to America’s westward expansion, the Trail of Tears, more about slavery, Nat Turner’s Revolt, Texas, the Alamo, the Texas revolution, the Mexican-American War, California, the 1849 Gold Rush.